I've been savoring our foggy mornings out in the garden while playing with my new macro lens. My messy winter garden has never felt so large, strange, and alien to me. Looking at the world through a new lens reminded me of a time that I taught a freshman trombone player how to look at the world a little differently. Six years ago, this month, My Pirate and I drove cross country to Washington DC in a 24 foot yellow Penske truck loaded down with Evergreen Marching Band's parade equipment for the Presidential Inaugural Parade. After a year of planning the band trip, we viewed our beautiful country under a blanket of snow in subzero temperatures and saw a meteorite explode on the deserted road in front of us. I'll never forget the happy relief that washed over me when we arrived at the hotel and were greeted by the marching band students and parents. I remember standing in the hotel lobby listening to our bus driver listing off his complaints and concerns about the itinerary while a fourteen year old girl leaned back on a bench, loudly sobbing with a trombone clasped in her hands. Finally, the bus driver took a breath and noticed her. He turned back to me and asked, "Aren't you going to do something about her?" "She's next in line. I'll address your concerns with the band director," I replied. And then I turned to the girl, stretched out my arms and she flung herself into them. I listened as she sobbed out her awkward story of hurt feelings. When she quieted down, I looked her in the eye and I told her about a game that I play when I'm having a difficult day. I count three things that went well during the day and three things that I'm grateful for. I gave her the assignment to do this exercise everyday of the trip and promised that I'd check in with her. She sniffed and solemnly nodded. The next evening, as I was walking the halls checking the noise level during quiet time, she waved me down, beaming. She excitedly ticked off the things that went well and her gratitude list. Then she proceeded to tell me three things that she liked about herself. I gave her a high five and her chaperone pulled me aside. With teary eyes, her chaperone wrapped her arms around me and whispered an emphatic, 'thank you!' in my ear. Throughout the trip, the freshman trombone student tracked me down and ticked off her long happy list with a big grin. What we choose to focus on shapes us. I used to hate winter in my garden because it was cold, wet, and slimy. Now, I'm outside grinning with a camera capturing all the action. 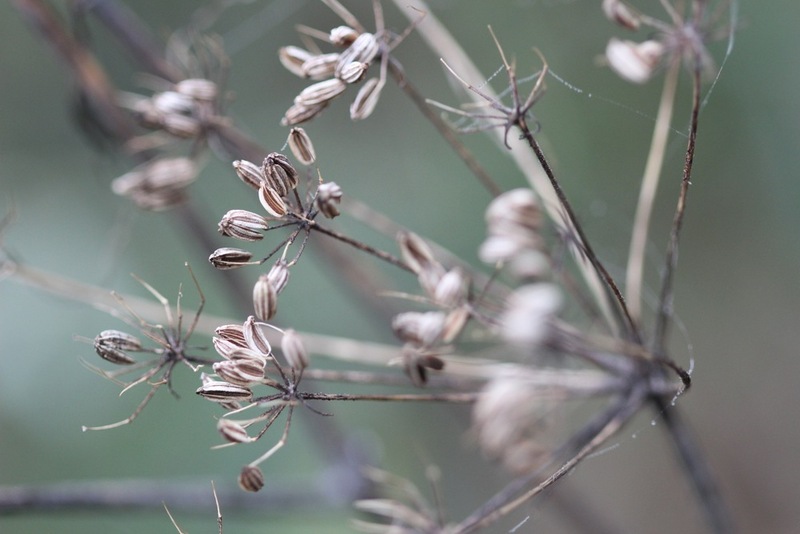 Slimy seed heads covered in mist…I'm there! My Pirate recently told me that the garden is a huge mess and I offered to buy him a new camera. The lens we look through shapes our experiences. My camera lens has helped me gain an appreciation of my messy winter garden. Has your camera changed how you perceive your world?